AGL Energy secures PPA of below $60/MWh for 453MW Coopers Gap Wind Farm, to be built in Queensland by 2019 after reaching financial close Thursday. AGL chief says deal signals private sector’s readiness to invest in Australian renewables – but warns policy certainty still vital. Just three months after Origin Energy stunned the renewables industry with a record low power off-take deal for the 530MW Stockyard Hill Wind Farm in Victoria, AGL Energy has delivered more of the same, securing an off-take price of below $60/MWh through the sale of its 453MW Coopers Gap Wind Farm, between Kingaroy and Dalby in Queensland’s south-east. AGL said on Thursday it had reached financial close on the Sunshine State wind farm – which will be one of Australia’s biggest, once completed in 2019 – with the $22 million sale of the project to the Powering Australian Renewables Fund. The deal includes AGL writing a PPA for electricity and associated renewable energy certificates of less than $60/MWh for an initial five years, with an option to extend the agreement for another five years at the same – or even lower – price. In a media statement, AGL said it expected the project to cost a total of around $850 million, funded through a combination of PARF partners’ equity and a lending group including Westpac, Sumitomo Mitsui Banking Corporation, Mitsubishi UFJ Financial Group, Societe Generale, DBS Bank, Mizuho Bank and ABN Amro. The result is undoubtedly a good one for AGL, which created PARF just one year ago, in partnership with the Queensland Investment Corporation, with the goal of using it to underwrite 1,000MW of large-scale renewables to be operated and managed by AGL. After making its first acquisition in November 2016, buying up the 102MW Nyngan and 52MW Broken Hills solar farms as seed assets, it has managed to keep growing its portfolio, adding the 200MW Silverton NSW wind farm in January 2017. “More than 800 MW of projects have now been vended into PARF in its first 12 months of operation,” said AGL CEO Andy Vesey in comments on Thursday. But Vesey – who recently attended a meeting of energy retail chiefs in Canberra to discuss the problem of Australia’s world-topping electricity prices – was keen to stress that public policy settings remained vital to maintain investor momentum. “Certainty on energy policy, including the implementation of the recommendations of the Finkel Review, will enable more projects of this kind to go ahead and help place downward pressure on energy prices by increasing supply,” he said. AGL COO Brett Redman said the Coopers Gap deal has demonstrated the effectiveness of the investment model, the falling price and increasing efficiency of renewables technology and the key role it had to play in Australia’s future energy market. The project, which will be developed by GE and Catcon, will use 123 specially designed GE turbines to produce around 1,510,000MWh of energy annually – enough to power more than 260,000 average Australian homes. For GE, the Coopers Gap contract will bring the global giant’s total installed wind capacity to almost 1.4GW in Australia by 2019, when the wind farm is expected to be completed. It is GE’s first wind project in Queensland. “That’s the largest number of megawatts in a single year by any GE onshore wind country outside the United States, ever,” said Pete McCabe, GE’s global president and CEO of GE Renewable Energy’s Onshore Wind business. McCabe, too, took the opportunity of this week’s news to call for strong and stable renewable energy policy in Australia. GE said the successful formula for its bid for Cooper’s Gap included custom-designed 115-metre towers for the 3.8MW turbines, to get the optimal wind speed. The engineering team – which included German wind engineering “boffin” Dr Joerg Winterfeldt – had to ensure that the design of the taller tower avoided vibration when the blades turn and also fit within the logistical puzzle of not being too heavy or wide to cross all the roads and bridges from port to site. 1. The implied capacity factor is 38%. Surprisingly good, if achieved, in Old. “Custom designed” is sales talk. They selected an optional extras package to improve yield. Same with Silverton and heat management, or a Norwegian wind farm with anti-icing. I noticed that capacity factor too. 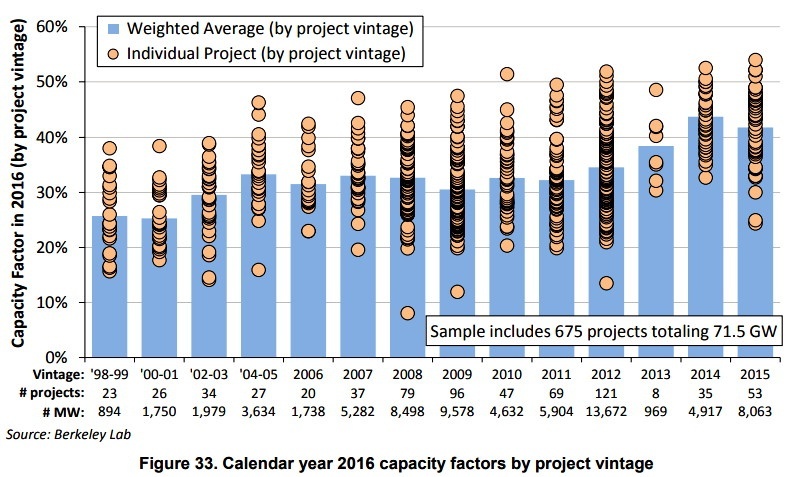 Sounds pretty good – Tasmania’s wind farms are achieving that in good years only – down in the 33s in calmer years. Just that $60/MWh figure alone should be the last nail in the coffin of any new coal-fired power station in Australia. If Turnbull did not have to appease the right wing red neck nut jobs, and a coal industry wedded to government handouts so they can wring every last drop of profit out of their soon to be stranded assets, no one would be even thinking about new coal fired power stations. As a point of interest, an industry superannuation fund offers an investment option called Global Environmental Opportunities which covers alternative energy, energy efficiency, green building, sustainable water and pollution prevention. It achieved a return of 21.7% over the 2016-17 year. One of its investments, Vestas Wind Systems lifted its performance by over 30%. Try getting that performance digging for coal! Out of interest, which fund has that GEO option please? What government handouts to coal industry are you referring too? 51,999 preventable deaths in USA from coal related air quality impacts. Translate to Australia, similar ratio per tonne of coal mined and burnt and many of our coal power plants wouldn’t be legal in USA, well not till Trump dissolves all the hard won EPA regulations anyhow. Then there’s hospitalisations and days off work. Then there’s the price you want to put on destroying most life on Earth per tonne of GHG emissions. Then there’s the fuel rebate refund. Then there’s the direct money paid to Griffin coal above the contracted price with Collie coal mine that Synergy (the Government) pays them. There’s probably others I’m missing. Not to mention the air quality regulations in Australia for coal fired powered stations are pretty much non existent, and generators have flat out admitted to fudging the figures when they cross the upper limits! Yeah Alinta was operating coal fired power stations in Australia that would not have passed USA regulations. The ones in SA that have closed due to economic unviability with 50% RE in SA and one in Victoria that was extremely unpopular with local residents and refused to release all the air quality monitoring data and only notified town when a warning event was triggered due to wind direction and emissions level. Although with the LGC price alone above $84/MWh, AGL is going to make out like bandits. Shows the bargaining power the big incumbents have, or maybe just their savvy negotiating skills. The incumbents are entrenched into the system and have established political connections and I’m sure a few campaign donations are made. Spot on. All the downward pressure on electricity prices is coming from RE, not from Coal or Gas or Turnbull’s EYEBALLS aimed at energy CEOs across a big table in Canberra. Yet, still we have those lunatics, the Abbott and the rest of the FF Boosters Club, banging on about building new Coalers ( with taxpayer dollars ) to provide “cheap” power. Just gotta laugh at the fools. Things are likely to get better down under. 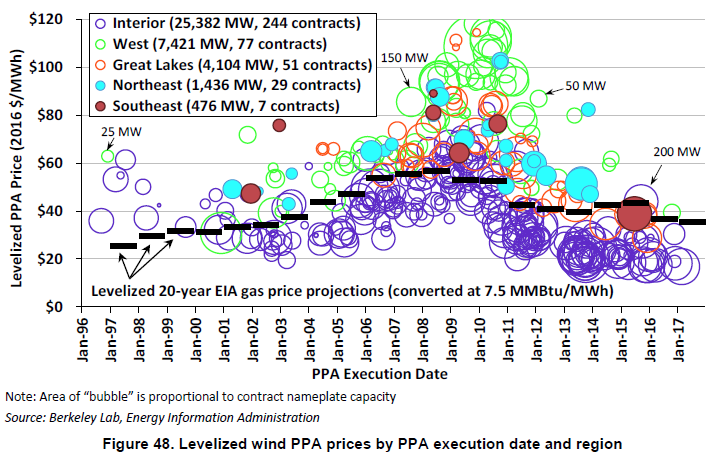 In the US we are now seeing 20 year power purchase contracts for less than $30 – unsubsidized. Less than $0.02/kWh with subsidies. And our wind farms brought online post 2013 are returning CFs in the low/mid 40% range. Up 25% from the 2004 to 2013 era CFs in the low/mid 30% range. You can play catch up with us re: wind price and performance. We’ll need to continue playing catch up with you on residential solar costs. We’re just breaking under $3/watt so at least double what you’re paying. We’re at less than a third what y’all are paying for solar. AUD$1.33 / kW on average at Aug ’16. A mainstream channel news item in the last week said a 5kW system can now (Aug ’17) be purchased for $5,500 on average i.e. AUD$1.10 / kW or USD$0.89 / kW. The cost reduction is 46% in five years. Come and take a visit down under in five years time from now and you’ll see solar panels on the sides of buildings, solar panels on sheds, pergolas and cape cods, solar panels on tree houses, cubby houses and out-houses, solar panels on hen houses, heck, on bird cages, on cows, on cats and on dogs. 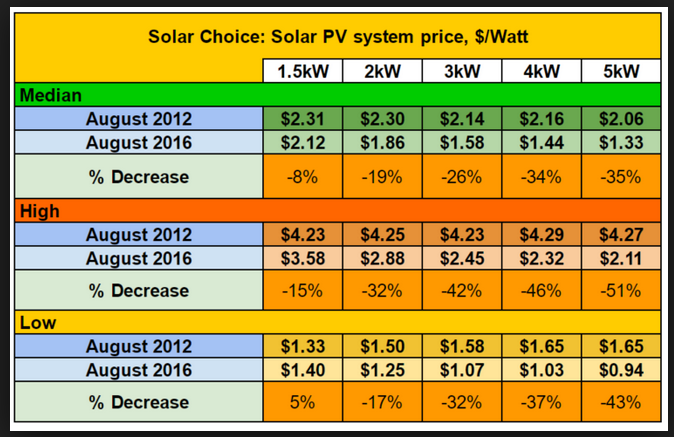 Much better now than in 2009 – which was AU$6.00/watt. As long as we don’t cut down the natural cellulose producing solar plants and replace them with artificial silicon ones. We don’t need to do that. Plenty of open space, roof space, desert space, etc in USA. I’m USA. Yes, you all are way ahead of us on residential Solar PV. Let’s hope we catch up their and you guys catch up on Utility Wind. The Tesla battery is the talk of the town here. I think this addition of commercial-scale power packs to wind farms will see a gear shift in wind energy, as investors see they can get a lot more value out of their windfarm with storage, particularly as battery costs continue to fall. They don’t even need to go all-out and have a huge battery like the Tesla one at Jamestown. Even small to moderate investments in storage added to windfarms will pay off. Storage is the catalyst that our wind energy needs to go to the next level. I’d love to see some offshore wind get started here as well. We have a few coastal kilometres here in Australia. AU’s extremely expensive grid electricity has been a huge driver for building a robust solar installation industry. Install panels and enjoy a big cost of power drop. The US has relatively inexpensive electricity so installing panels in most states doesn’t result in much savings. At least during the system payoff period. It’s not just the cost , there were 4 factors for me . Don’t you want to sell your excess power back to the grid? Fair enough for remote areas where connection is a significant issue and expense. I think most people though (in cities and populated regions) with solar will choose to stay connected to the grid rather than build triple redundancies into their home system. The exports of the their excess generation can then earn enough to pay the fee for grid connection, which will be needed at least a dozen days of the year in shoddy weather regardless the size of their rooftop solar or home battery. I agree if on grid contribution is the better option. Australians generally buy their solar panels to own, whereas I’ve read that over there you guys generally lease them? Is that correct, and how would that affect competition and the rate of price reduction? I don’t know how the purchase/lease ratio works out. I live in an area where everyone owns because we are all off the grid. What makes our residential prices high, as I understand it, is that solar systems here don’t sell themselves. An amazing percentage of the installed price goes into the cost of acquiring customers. And a sluggish industry doesn’t present much competition or economy of scale to bring down prices. In AU you were working with very expensive electricity so people sought out installation companies. In Germany the feed in tariff was set so high initially that people jumped at the opportunity to install solar and make a profit off the FiT. “enough to power more than 260,000 average Australian homes” when the wind is blowing I presume. Output subject to 1/2 cube of velocity of the wind of course. What does this mean? Any scientific explanation why the electricity output would be a cubic function of wind velocity? As e=0.5mv^2, I would have thought the kinetic energy of the air molecules would increase as a square function of the wind velocity – not as a cubic function. I agree it seems strange but a quick search suggests it is true. I think the point is that as the velocity increase you not only get each particle of air having v^2 more energy but you get v times as many particles. So v^3 all up. I wonder if the same applies for wind resistance for a motor vehicle. Don’t know but you’re probably on the right track. Aerodynamic drag does increase non-linearly with increasing vehicle speed. I’ve read 50% of a typical car’s motive power goes to over coming aerodynamic drag at 55 mph (IIRC on the 55 mph). It has been surprising to me that aerodynamics is ignored so much in car designs. On the other hand, they are building them closer to the ground for reduced drag. Something I hate because i often drive on rougher roads. Oh well, enough green electricity potential to get all of us where we’re going without any improved aerodynamics. Drag isn’t so overlooked in car designs, it’s part of the trend towards high rear ends low sloping bonnets etc. Of course USA has missed most of these trends with it’s obsession with big, ostentatious design that purposely thumbs it’s nose at fuel efficiency as a marker of wealth and status. Madison avenue did research years ago to find that people wanted crabs, a hard “safe” looking shell (SUV/4WD) high on the road to see over other cars (and block cars behind them) but soft and spacious like a lounge room inside. They spent a decade moving the car industry in that direction and even the European and Asian marquees were forced to follow that direction with some lines eventually. I was going from memory. Read about the physics of this 35 years ago, but have also run into that fact since. The wind farm is expected to produce 1510 GWh/y, which is about 260,000 times the annual energy used by a typical house. On a moment to moment basis, the wind farm may produce more or less than used by those houses, but on average it will produce the requirements of about 260,000 houses.